Credit: Creative Commons Attribution-Share Alike 2.5 Generic license. Rotating black holes and computers that use quantum-mechanical phenomena to process information are topics that have fascinated science lovers for decades, but even the most innovative thinkers rarely put them together. Now, however, theoretical physicist Ovidiu Racorean from the General Direction of Information Technology, Bucharest, Romania suggests that powerful X-rays emitted near these black holes have properties that make them ideal information carriers for quantum computing. This work was recently published in New Astronomy. 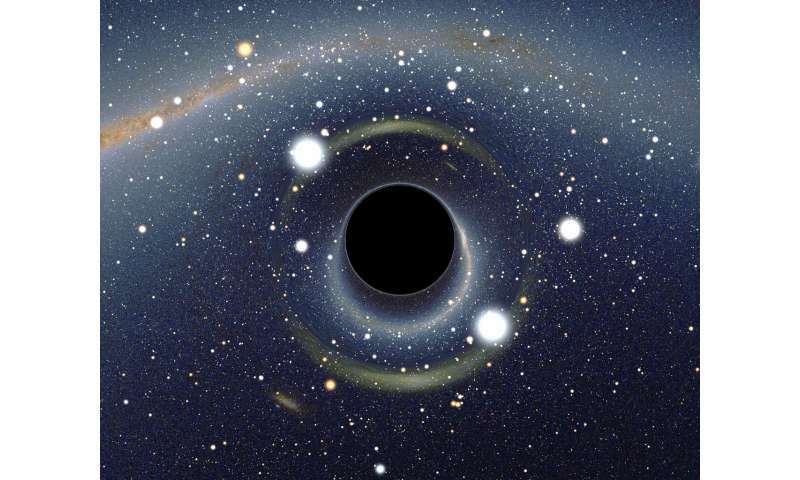 The term 'black holes' is widely known, but not everyone knows exactly what they are. When stars come to the end of their lives, they can collapse in on themselves under their own weight, becoming denser and denser. Some may collapse into a point with essentially no volume and infinite density, with a gravitational field that not even light can escape from: this is a black hole. If the star that forms it rotates, as most stars do, the black hole will also spin. Material that gets close to a rotating black hole but does not fall into it will aggregate into a circular structure known as an accretion disk. Powerful forces acting on accretion disks raise their temperature so they emit X-rays, which can act as carriers of quantum information. The photons that make up the X-rays have two properties: polarisation and orbital angular momentum. Each of these can encode a qubit (quantum bit) of information, the standard information unit in quantum computing. "Lab-based researchers already use beam splitters and prisms to entangle these properties in X-ray photons and process quantum information," says Racorean. "It now seems that the curvature of spacetime around a black hole will play the same role as this apparatus." Thus far, however, this process is only a prediction. The final proof will come when the properties of X-rays near spinning black holes are observed, which could happen in the next decade. Two space probes with the same mission will be launched around 2022: the Imaging X-ray Polarimetry Explorer (IXPE) by NASA, and the X-ray Imaging Polarimetry Explorer (XIPE) by the European Space Agency. These will investigate the polarisation of all X-rays found in space, including those emitted close to black holes. "If we find that the X-ray polarisation changes with distance from the black hole, with those in the central region being least polarised, we will have observed entangled states that can carry quantum information," says Racorean. This topic may seem esoteric, but it could have practical applications. "One day, we may even be able to use rotating black holes as quantum computers by sending [X-ray] photons on the right trajectory around these ghostly astronomical bodies," Racorean concludes. Additionally, scientists believe that simulation of unusual states of matter will be an important early application of quantum computing, and there are few more unusual states of matter than those found in the vicinity of black holes. "Thus far, however, this process is only a prediction. The final proof will come when the properties of X-rays near spinning black holes are observed, which could happen in the next decade." What force produces x-ray? Do we need to venture all the way out to a theoretical black hole to find the necessary processes for testing this quantum model? It's fun to speculate, but perhaps the answer is much closer to home. Note related story "Black holes on Electronic Chip"... is their a clue in that title?